Lot Detail - Scarce Montreal Canadiens 1924-25 Player Photo Collection of 7 Featuring Vezina, Joliat, Odie and Sprague Cleghorn and Sylvio Mantha - World Globe Jerseys! 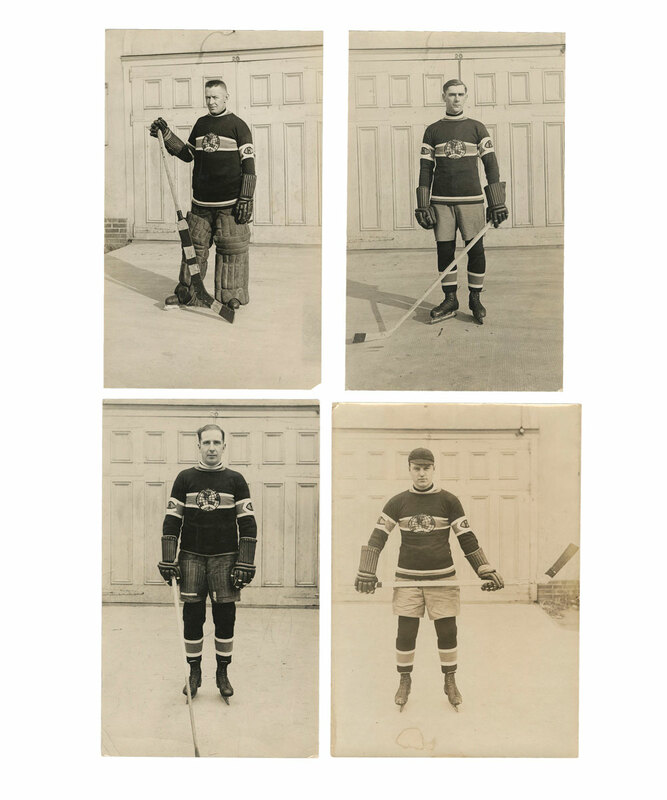 Scarce Montreal Canadiens 1924-25 Player Photo Collection of 7 Featuring Vezina, Joliat, Odie and Sprague Cleghorn and Sylvio Mantha - World Globe Jerseys! Reminiscent of the boastful jerseys sported by the New York Giants in 1906 that proclaimed “World’s Champions” to all - including their unimpressed opposition, the Montreal Canadiens opted for a large globe-shaped crest in place of their usual “CH” emblems in 1924-25, reminding all competition of their current status as Stanley Cup and “World” champions. We have an exceedingly rare collection of 7 original Canadiens photos from 1924-25, with each player proudly wearing his “globe” jersey, with these the only examples we have ever seen or handled. Missing just Howie Morenz for the complete roster of prominent starting players, included, we have photos for iconic legendary keeper Georges Vezina, arch-villian defenceman Sprague Cleghorn and Billy Coutu, along with Sylvio Mantha, and all-star forwards Aurele Joliat, Billy Boucher and Odie Cleghorn. As mentioned, each player is featured in his full Canadiens “globe” uniform, with this collection arguably some of the rarest and most desirable Habs photos in existence. The Vezina, Peg, Coutu and Mantha photos are all in the 3 ½” x 6” range give or take, with the Joliat, Odie and Boucher photos all approx 4 ¾” x 6 ¾”. Each photos has the player’s name handwritten in pencil over the reverse (the Joliat has just “918” written), with the smaller four all having faint “Velox” stamps over the reverse. Creasing/wrinkling has occurred to each photo along with minor corner wear, with toning over both the front and reverse. The Boucher photo has three torn corners along with a small tear, with a section of paper loss along the bottom right. We should also note a stain on the Joliat photo along the bottom section, with a piece of yellowed clear tape on the reverse of the Odie Cleghorn photo.